Tonight I'm drinking Drink Up! 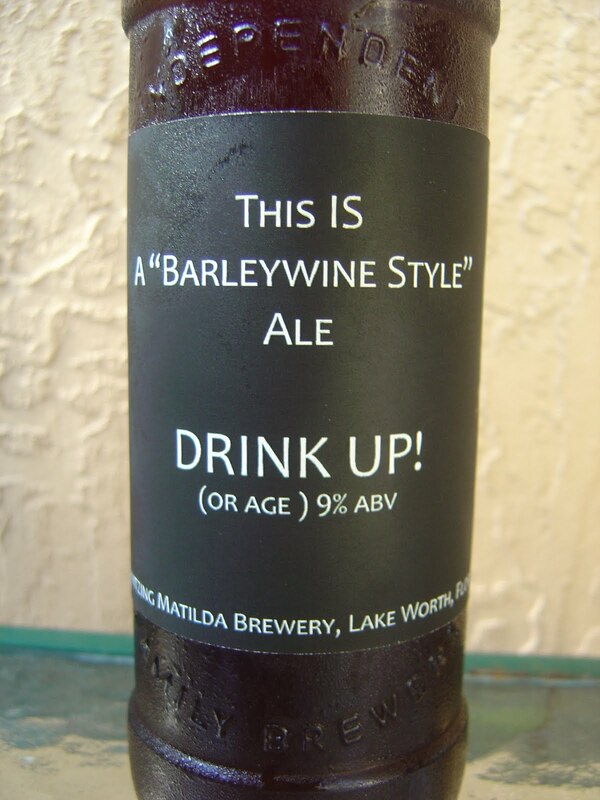 Barleywine, a home brew by Brent over at the Shvitzing Matilda Brewery in Lake Worth, Florida. Which one of you guys said we don't have some great breweries down here? Brent is actually Home Brew Vanessa's husband, and he was kind enough to have her deliver this to me last week. I think there is quite the household rivalry up there in Palm Beach! The name actually adds "(Or Age)" which I thought was great, and this brewery is producing quite the cool labels, which I've heard is one of Brent's responsibilities. Cap indicates BW 7/21. Nice aroma, the second the cap came off. Pine, spicy, hoppy, citrus. The flavors start out a little sweeter than I was expecting with lots of caramel, quite the chewy beer here. There are pine flavors but not as much as the aroma suggested. Some orange citrus flavors are also present. The spicy black pepper is there, but doesn't provide as much bite as I would have liked. 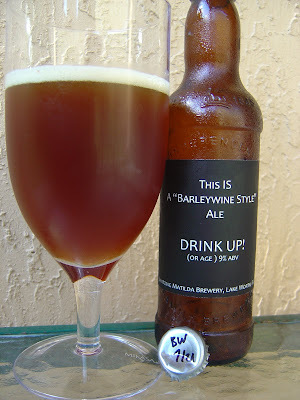 This barleywine has dominant malty and sweet flavors, while I prefer this style with a bit more of a bitter punch. 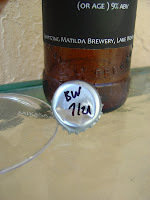 I also think that a little more carbonation would have accentuated the black pepper and spiciness, as those two components usually work really well together in this style. 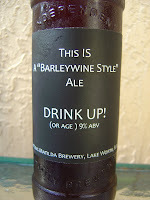 The 9% alcohol gave a nice warming feeling and was noticeable while not annoying. Brent, this was terrific. I really liked it. Thanks so much for sharing it. If the review in any way sounds ungrateful, well, get in line or send out the pack of wolves after me. Either way.